Leslie Tucker employs digital media in the generation of visually and contextually elaborate documents commenting archly on American consumer culture. The documents themselves, from postage stamps to stock certificates to legal forms to flow charts to all manner of paper-borne banality, tend to be depicted in gridded accumulations inferring the social and personal costs of consumption. In all cases Tucker has enlivened their already potent graphic presence with pointedly humorous evocations of our appetites, habits, and reliance on and expectations of commodities and devices. The icon at the center could be as distinctive as a Coke® bottle or as generic as a slice of bread. 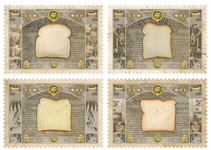 But even the bread, Tucker reminds us, is packaged in a certain way – a way that also affects our behavior and our health.